The TK-7000 comes equiped with 45 raised keys and 108 key reversible spill-resistant flat keyboard. This is an excellent feature for restaurants as the keyboard can be flipped for different menus. The TK-7000 can be equipped with an optional RAC-9 memory card. This card contains your system program which can be transferred to other TK-7000s for quick system program uploads. 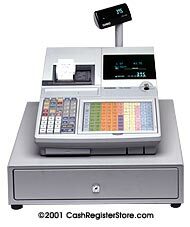 The TK-7000 comes with a scanning capability under stand alone scanning and it can be expanded to 20,000 items by adding optional memory chips. Essential functions for the scanning environment such as Not Found PLU, PLU batch maintenance file, bottle link and Mix and Match functions are available on the TK-7000 model. Another outstanding feature is the TK-7000 can be programmed and used in Spanish, French and German.